I hoped a species rose might have some extra resistance to the rosette virus, which is really common around here. It couldn’t be TOO gigantic [well, actually, that’s a lie. There are only a few that would get TOO big for our very limited space]. I considered a yellow or a white rose, since I don’t have any of those colors. As always, I wanted something that would make a good-looking plant, even when not in bloom. After some serious weighing of options, I decided to buy what is reputed to be a repeat-blooming swamp rose. [Most species roses bloom once a year, like azaleas]. The swamp rose, Rosa palustris, is a North American native, and because my dad’s ancestral home is in a Mississippi swamp, Bob calls me “Swamp Rose.” The fact that this was reputed to be a repeat-blooming cultivar sold me on it. Good news! It does appear to be repeat-blooming [blooms on new growth]: it’s already blooming on the new growth it shot out in all directions as soon as I planted it in early May 2014. This picture was taken late June 2014. And the plant’s form is even prettier than I’d realized — open and airy, with graceful foliage. It reminds me of Mutabilis, which makes a pretty plant. 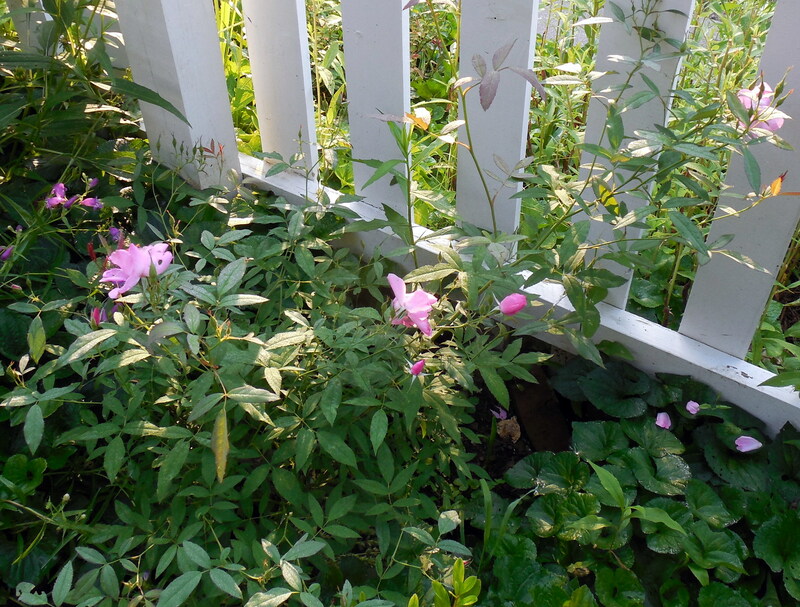 This entry was posted in design rules, recommended rose varieties for the Midwest/Upper South, rose pictures and tagged Antique Rose Emporium, Rosa palustris, swamp rose. Bookmark the permalink. 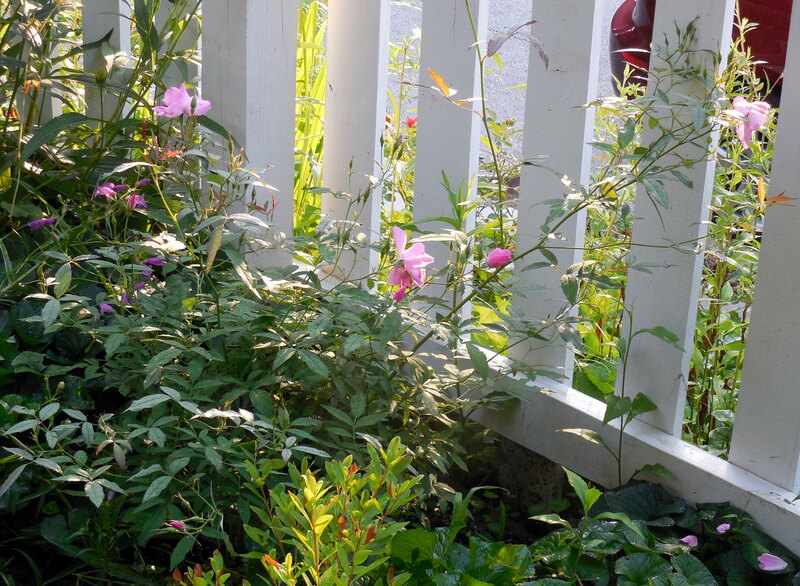 I am considering planting several Swamp roses, which I will purchase from ARE. I was ready to purchase v. Scandens, but then I saw your blog post about the remontant Swamp Rose. Now I need to decide which ones to purchase. Did your swamp rose continue to perform later in the season? Would you recommend featuring it prominently in your landscape, and do you know how it compares to Scandens? Thanks. Hey, I’m glad you asked. My “repeating” swamp rose not only repeats, but it was never without a flower until just now when we got our first frost here in Central Kentucky, which is really unusual in a rose’s first growing season. I’d have to call it everblooming. Over the season it built up to about 3’x3′ and kept its globular though airy form, no black spot or August leaf drop. It’s beautiful, and I am charmed. You’ve reminded me to cut a few twigs to see if I can’t start some more plants of this one: I will feature it as prominently as I can in my space. I don’t know how large it will get here in Zone 6 — we shall see. It grew pretty quickly its first growing season with me — but it does have a great fragrance. A real winner. I guess the remontant form is not well-known, but it ought to be. It’s a really enthusiastic grower here and such a pretty, healthy plant!